Our Newsletter Has a New Layout! 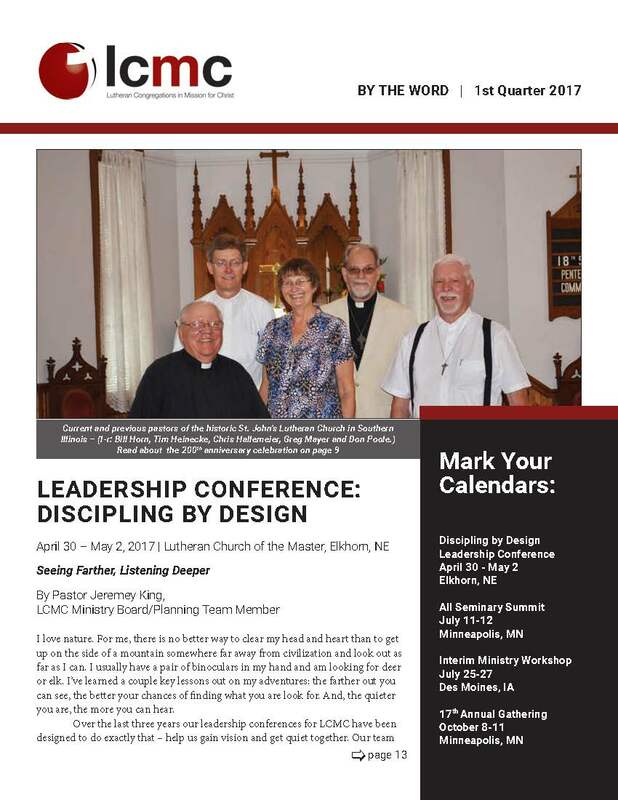 This quarter, BY THE WORD, our print newsletter, is rolling out with a fresh new layout design to accompany the new logo, website and mobile app that we launched at our 16th Annual Gathering in Denver last October. The color scheme and design of our updated logo represents our hope as an association of congregations: bringing Jesus to a dark and broken world. The red in the globe represents the blood of Jesus bringing light into the world, and the red “M” of LCMC emphasizes our focus on mission. By creating a cleaner, more contemporary layout for our newsletter and website, as well as incorporating the colors and design elements from our logo, we hope to embody the mission and vision of our association and to clearly communicate who we are: a first century church for the twenty first century. Speaking of the twenty first century, if you haven’t already, be sure to check out our mobile app, and to share it with your congregations as well. The LCMC Mobile App makes it easy to access calendars and event details, stream videos, and podcasts (it’s Apple TV and Chromecast compatible! ), and connect with other people throughout the association. The app’s built in blog reader makes it easy to stay up-to-date on recent news and announcements, and app users can also sign up to receive occasional notifications so you’ll never miss out on an important announcement or deadline again. With easy access to the LCMC directories and the congregation search feature, you can contact people or find nearby congregations even when you’re on the go. Be sure to check your mailboxes, as our 1st Quarter 2017 edition of BY THE WORD is on the way! Alternatively, you may download a printer-friendly PDF version of the newsletter by clicking here.